Farha Hasan is a writer based out of Boston. She has been writing and publishing short stories for the last ten years. Her stories stories have been published in various ezines and small circulation press such as, The Binnacle , Down in the Dirt, Toasted Cheese, Wild Violet, Skyline Magazine, The Broadkill Review and the Griffin. 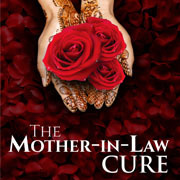 The Mother-in-Law Cure is a modern day fairy tale that chronicles the rise of the book’s central character, Humara from orphan to power matriarch in an affluent family. Humara’s influence spans generations and continents, but things are seldom as they appear. Humara’s prosperity is not simply good fortune but stems from something dark and sinister – as those who encounter her quickly begin to realize. It seems that nothing can stand in Humara’s way as she pulls the strings of those around her, until she meets the unlikeliest of nemesis. Another young orphan whose status in the household is little more than a servant will be the instrument of Humara’s demise. The Mother-in-Law Cure is an urban fantasy that takes you from Pakistan to the Middle East and back to the United States. To read more fiction by Farha Hasan click on the links below. To learn more about Farha click here.